There is nothing else that proves the dedication of Accace than the CSR actions the company takes time after time. These actions are the cornerstones of the whole organization, and we believe the best support to be given is what we do with our bare hands in order to offer immidiate help and create lasting value. 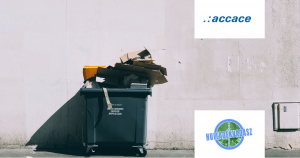 In this spirit, the Hungarian branch is pleased to announce their latest partnership agreement with an organization, namely with the so called Wastehunters (Hulladékvadász in Hungarian), which stands so close to values of the employees of Accace. This way, our Hungarian colleagues are able to prove their passion towards their profession, by taking care of the organization’s accounting processes. The support has fallen on this specific organization, because of the noble goal that the Wastehunters have set, namely to eliminate the garbage of the streets, parks, and cities of Hungary and it is an objective that the employees of Accace Hungary proudly stand for and gladly support with their professional work. More information on the project can be read on the website and Facebook page of the organization (in Hungarian). The exact goal of the Wastehunters in short is the movement of civilians and residents, who are sick of the dirt and garbage in their environments. We ancourage everybody to make an impact on the environment (or on anything else that matters you the most) by providing any form of support no matter how.